IBASSIN: 2017 Walmart FLW Tour Potomac River Day 2: Tom Monsoor Leads with 36-04lbs! 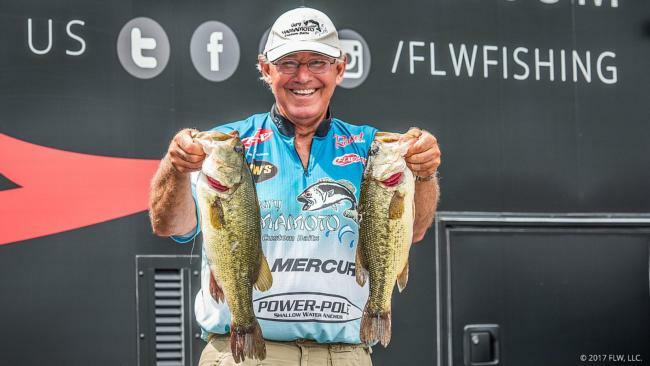 2017 Walmart FLW Tour Potomac River Day 2: Tom Monsoor Leads with 36-04lbs! Bryab Thrift Wins 2017 Angler of the Year! Monsoor grabs lead with hot morning. Tom Monsoor is known for two things: swim jigs and rivers. Both may finally be converging perfectly for him after two days of the FLW Tour on the Potomac River presented by Costa Sunglasses. Despite his strengths, Monsoor has had an up-and-down history on the Potomac, in large part due to the tides – he admits he never had really been able to figure them out. On day one, he thought it finally clicked, as he utilized a pattern he felt was tide dependent. Helping the matter was his boat position of 149, which allowed him to capitalize on both key feeding windows brought on by the tide changes in the morning and afternoon. However, being in the first flight Friday, and with the tides backing up an hour, he knew he really only had the morning window. He made the most of it, cracking 16 pounds, 14 ounces to take over the lead with 36 pounds, 4 ounces. On Friday the veteran hit the same two areas he caught all his fish Thursday. The first area is only 100-200 feet long, but he’s caught a limit there quickly both days despite it being “packed” with boats. The second area is the one that makes Monsoor grin, as it’s 100 yards wide and has been producing better quality. It was a good thing Monsoor was done so early, as his batteries went dead and his livewell began leaking, forcing him to stop and refill his livewell any time he ran so much as a mile. He’ll get both of those issues fixed for Saturday. He’s also hoping the top-20 cut helps fix his other issue, which has been fishing pressure.